The Conor McGregor era has officially begun! The Irish superstar shocked the world in Las Vegas last night, knocking out José Aldo in a mere 13 seconds to unify the UFC featherweight championship. Of all the potential outcomes of the highly anticipated UFC 194 main event, it’s safe to say not many people were expecting it to go down like this. Except, perhaps, for McGregor himself who had actually predicted he would “embarrass” the Brazilian with a knockout in the first round. Former champ Jose Aldo had never been knocked out in his illustrious career and had been unbeaten since 2005, winning 18 fights in a row to earn his status as the greatest featherweight fighter in mixed martial arts history. 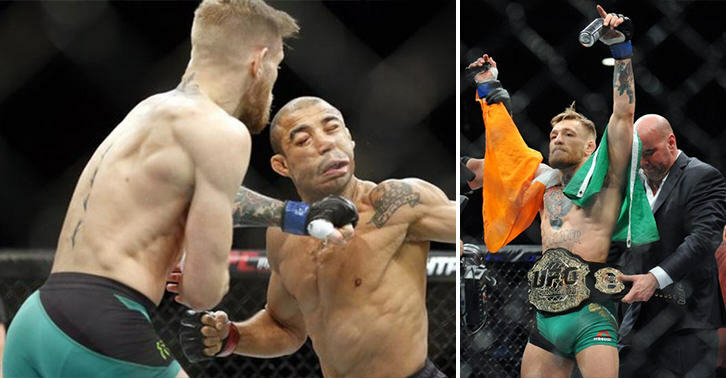 But it took just one devastating left hand punch from McGregor to spell an end to Aldo’s night and make history – the 13 second KO was the fastest finish in UFC title history, beating out Ronda Rousey’s 14 second stoppage of Cat Zingano earlier this year. Nobody can take that left-hand shot. He’s powerful, and he’s fast. But precision beats power, and timing beats speed, and that’s what you saw there. I feel for Jose. He was a phenomenal champion. We deserved to go a little bit longer. But it would’ve happened sooner or later. No power. No power. Just precision. No speed. Just timing. These are fundamentals. That’s all it takes. Yesterday at the weigh-in, I didn’t want to get off the stage. I wanted to embrace every bit of it. Sometimes, it’s over before you even know it. After the bout, a gutted Aldo said he wanted an immediate rematch, but whether he actually gets one will remain to be seen. After all the talk from McGregor, he definitely backed up his words. What an unbelievable performance from Ireland’s favourite son and an incredible night in UFC history!